All stickers will be packaged with corrugated cartons, carton size and weight depend on your sticker size. PLS: customized packings are available. Color: 1-Full Colors, CMYK, Pantone available. Material: White / Clear Vinyl, PET, PVC. Quality: Removable with No Residue, UV and Water Resistant, Without Damaging Glass, colors keep 3 - 5 years in outdoor. Logo & Design: Custom Produced as Client's Size / Artworks. Packing Option: Individually Sheets / Rolls, Packaged with Corrugated Box. Lead Time: 3 - 5 Days after Proof Approval. Payment Option: PayPal / Credit Cards, Wire Transfer, Western Union. Samples: Free Samples Shipped for Client's Evaluation. Shipment: Shipped By Fast DHL, Fed Express, UPS. Seasonal window clings are a cost-effective, eye-catching, creative solution. Looking to highlight a seasonal promotion or special deal? These designs easily peel on and off the window, and are designed for multiple applications. 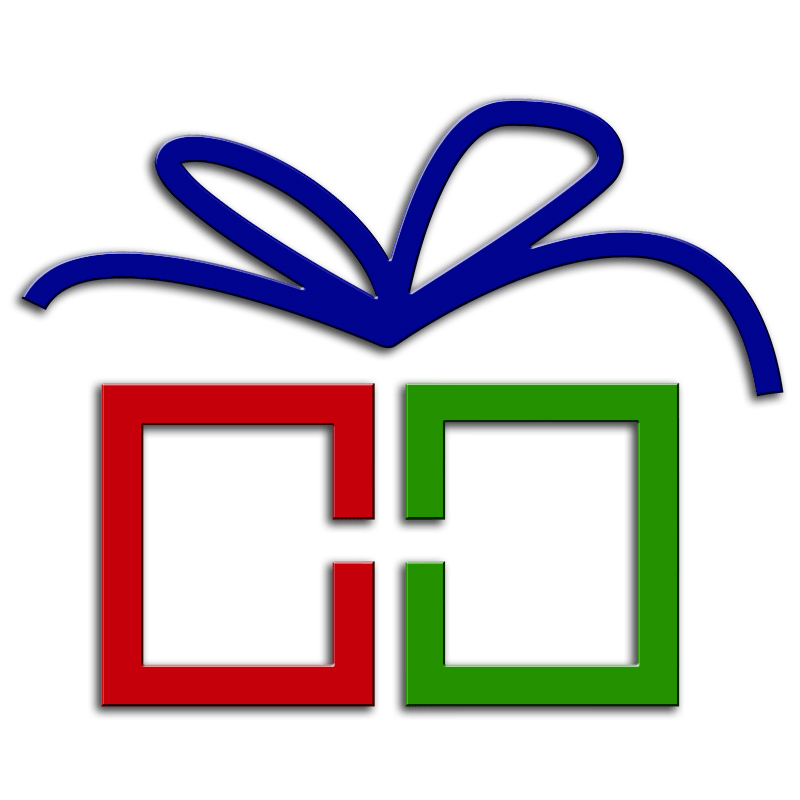 So feel free to advertise a holiday special - with the peace of mind that when the holiday is over, you can easily swap the advertisement to promote a new product. Window clings are basically window stickers that use static electricity to adhere to the glass surface. When you're done using the cling, simply and easily peel it off. No mess, no fuss! At Stonedoing Industry, the work is already done for you. All you have to do is pick a design from our seasonal or festive range, choose a size, color and material. The stickers can be produced in glue less self cling material, which makes installation easy, and the stickers reusable. As a retailer, your display windows are literally your windows to the world. They are the face that you present to passersby, the first impression you make with customers, and the easiest way to draw attention away from your competitors, or convey an important message, like a forthcoming sale. Many retailers overlook the potential of their display windows to grab the attention of potential customers. Think of them as three-dimensional billboards. It is important to make your shop stand out from the rest of the high street, especially in this difficult economical situation, and Stonedoing Industry’s stickers are guaranteed to attract the all important passing trade, without breaking the bank. UV and water resistant vinyl prevents fading or weathering. Don’t want to wrap your entire vehicle but still want to gain prime advertising? Why not use your windows? Window graphics are a perfect advertising opportunity. You can display all of your information on your windows, and in full color and still see through them for safe driving. Vinyl graphics can be removed from windows without damaging the glass. This permits easy modification when it is needed. Window graphics are ideal fro such items as business names, logos, goods and services, and contact information. Ask your Signs Now representative for the latest information about window graphics techniques and materials. Stonedoing Industry offers 2 sided decals, to double your advertising. We offer multiple solutions of double sided decals to meet your needs. Affordable and effective, you'll love our Double Sided Decals! You pick the shape and the size, we have a full line of materials! Lastly, our double face decals come in screen printed spot color or even full color. There are many applications for our double sided decals. Since we offer double sided decals on multiple materials you can use them for almost anything. There are many great applications like store doors and windows. You get your guests inside and outside reading your message. 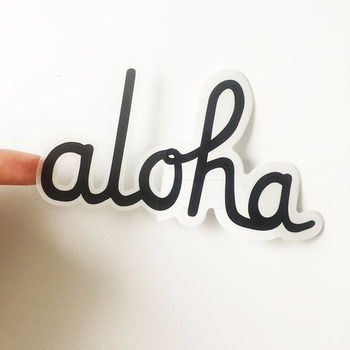 Permanent Adhesive Double Sided Decals- Use Permanent adhesive for a long lasting decal that you want to stick for a while, still easily removable within 6 months, perfect for outdoor use. Temporary Adhesive Double Sided Decals- Temporary is designed to stick, but also be removable. It's great if you need to reposition or reapply your double sided decals. Static Cling Double Sided Decals- Static Cling is perfect for windows and doors. Easy to apply yet durable. The static will firmly hold the decal in place, but is not recommended for moving cars. Not only do we print on multiple materials but we print multiple ways. Full Color Double Sided Decals or Spot Color Double Sided Decals. You can print photograph quality four color process or if you just have 1 or 2 colors use spot color printing to save you money! White is a color that is used as the barrier in the middle, So no extra for white! Beware that sometimes these items can also be called two sided or Double sided Stickers. Window decals that work! If you have a storefront on a busy street, you need eye-catching window signs to attract foot traffic and to stand out to cars driving by. And if your business is located in a strip mall where all the stores look the same, you need to stand out from the other stores with a professional window graphic using vinyl window decals or vinyl window clings. 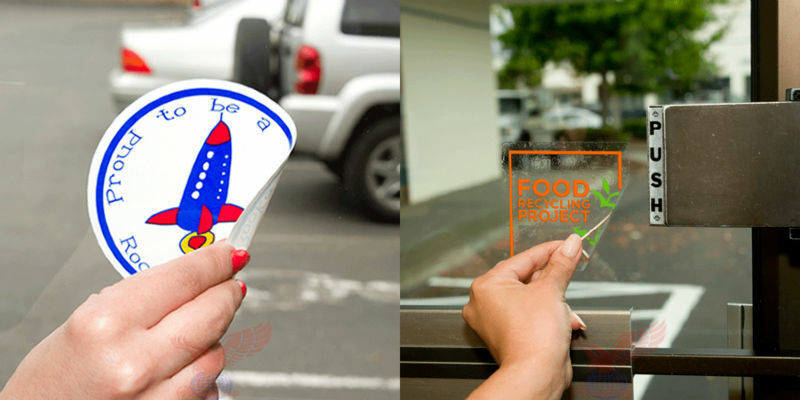 Window decals are a fast, easy and fun way to get creative and attract customers. Whether you want your store or brand logo to stand out, or need no cell phone signs for restaurants, if you want QR Code stickers for the window, or your store hours sign to stand out nicely … all that and more can be done right here! A unique way to get your store to stand out from the crowd, you can easily decorate the front entrance for every holiday or season from summer to winter, or simply have your store name and logo on your window so it stands out easily. In just a few simple steps you can have your decals to your liking using our Sticker Maker. Upload your logo or images, then improve the size and adjust as you like! Stonedoing Industry’s high quality, glossy material is bubble free, so it will go on smooth with no creases, giving it a nice, sleek look. When it’s time to remove and change to a new decal, they will be easy to remove, leaving no messy residue behind to have to clean up afterwards or harm your store front or windows. You will have no hassle if you want to update your images frequently with Stonedoing Industry! 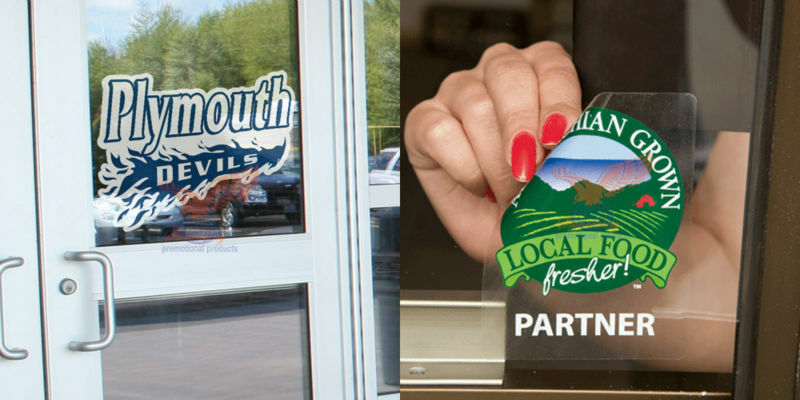 Our custom static window clings are great for your retail storefront or car windows! Clear static cling is an effective way to advertise in your storefront for a short period of time. With Stonedoing Industry’s clear static cling, you can remove, reposition, and reuse your advertisements as needed. Another advantage of clear static cling is that you can promote your products or sales without blocking out visibility through your windows. No customer likes to feel trapped in your store when shopping, so use clear static cling instead of a solid material for your window advertising. Since clear static cling doesn’t have adhesive, it’s not the best choice for long-term graphics, but for temporary promotions like holiday sales and grand openings, it’s perfect. 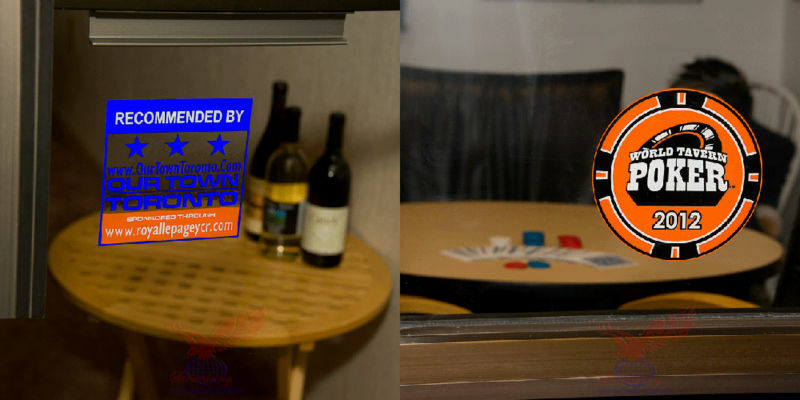 Stonedoing Industry is your go-to provider of custom clear window clings. Clear window clings can be produced with any custom design you choose. When ordering clear window clings from Stonedoing Industry, you can upload your own completed design or choose from one of our professionally-designed templates. 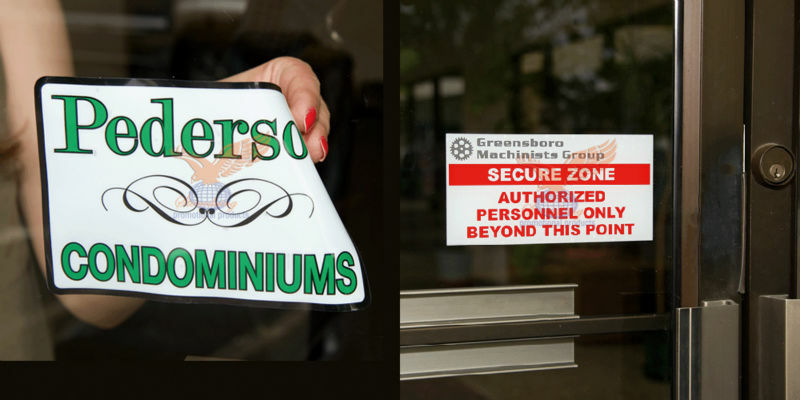 Any of these templates for clear window clings can be customized with your business information, logo, colors pictures of your products, etc., using our free online design tool. Stonedoing Industry is one of the few companies around with the capability of white ink printing—this means that your clear window clings can have a completely-transparent background and completely-solid images and text. In addition, we can also produce clear window clings with a see-through color background or images, which look similar to stained glass (remember that when printing on Clear Static Cling, lighter colors will be less-vibrant). To achieve one of these looks, simply specify in your Order Notes how you would like us to produce your transparent window clings. Transparent window clings are available in any customize size you need. We also offer continuous quantity discounts, so you can order as few or as many transparent window clings as you’d like. Measure your windows carefully so you get the exact dimensions needed for each transparent window clings. In addition, decide whether or not the transparent window clings need the "Inside Glass" option. Since our clear cling film has no adhesive, it’s generally recommended that you add this option so that your transparent window clings can be installed inside your window facing out. This protects them from weather damage as well as vandalism—just make sure your windows aren’t tinted so that you’ll be able to clearly see the transparent window clings. Clear static cling shows off what’s new at your store or business. Start customizing clear window clings using Stonedoing Industry’s full-color templates and user-friendly design tool—it’s free and easy. Order transparent window clings today!